When I attended Boys State as a junior in high school at Indiana University Bloomington, the elected governor was Jim Grant from Columbia City. I was stunned coming from little Nappanee. A student politician from a neighboring city that was a sports rival had become the governor of my state. I had never given thought to such levels of competition. Two years later we became Beta Theta Pi fraternity brothers. Although not close I continued to admire his academic talents. After college (quite a bit) we sailed a 26’ Balboa on Lake Wawasee. Through the mail I purchased a storm sail kit. Upon receiving it, the catalog gave a history of the company from California. Jim Grant founded it while living on an old wooden sailboat in a Chicago harbor while pursuing a graduate degree from University of Chicago. On that boat he started Sailrite. He moved back to Indiana and kept selling kits. I never finished the storm sail; in fact the masking tape outline is still half way on my basement floor. As part of this celebration, the mayor asked me to reflect on Dave Widmoyer’s place in the Nappanee Community. I speak merely as a citizen of Nappanee. It is appropriate and proper that we stand here where the B&B Restaurant was a landmark for 68 years; opening its doors in 1925 in a relocated building from Locke, the forerunner village to Nappanee. It was the year Adolf Hitler published his personal manifesto Mein Kampf, John T. Scopes is found guilty of teaching evolution in a high school class and was fined $100, The Grand Ole Opry made its radio debut on station WSM, and Benito Mussolini announced he was taking dictatorial powers over Italy. 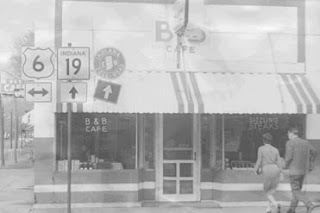 Over the next nearly seven decades, from its coffee counter, stools, and tables, Nappanee’s growing citizenry dealt with the Great Depression when the B&B sold egg sandwiches for 1 cent. In 1936 the B&B added air conditioning to maintain a temperature of 78 degrees. It saw Nappanee convert its manufacturing facilities to World War II production. It survived the coming of television, the Korean War, Vietnam, the assassination of President Kennedy, the Civil Rights Movement, Richard Nixon’s resignation and the personal computer. The B&B closed its doors the year the Holocaust Memorial Museum was dedicated and Martin Luther King Jr’s birthday was made a national holiday. Within its sight the B&B saw the high school move four times, the kitchen cabinet industry flower, falter, and fail to be replaced by the present vibrancy of today’s RV and modular housing economy. It saw Willard Price become Nappanee’s first mayor in 1925 and Dave Widmoyer become its first City judge. The B&B was a famous destination and stop on the Grand Army of the Republic Highway, the nation’s longest. The “Sizzlin Steak” on the neon sign in the window I was told repeatedly by my father was invented here. The Walleyed pike and oyster stew could have been. I am the last generation to grow up at the coffee counter at my father’s knee. The stools were lined early morning, mid morning, at lunch, and mid-afternoon. The tables were filled at dinner. The coffee was secondary to the interaction, the pulse of Nappanee being taken, and concrete plans hatched and acted upon for the city’s betterment. Many B&B napkins were used to plan our future with notes and doodles. A lot of good got done here; it was before decaf. Following his graduation from DePauw with a degree in English (mind you as a youngster I didn’t know anyone who graduated from DePauw and I certainly didn’t know anyone with a degree in English,) he returned to join his father Bunk behind the cigar counter with the quaint Amish figurines where he watched the world of Nappanee pass by. That world, with coffee in common, included the police chief and single deputy, the superintendent, the optometrist, the dentist, the band director, the doctors, the lawyers, the teachers, merchants by the dozens, the Coppeses, the Mutschlers, the Ulines, and an Amish farmer or two. I tell you all of this because it is the background that molded Dave Widmoyer and gave him his life long respect for and commitment to Nappanee. He could have sided with all of the second guessers, complainers, and bigots who filled that counter with their elbows and become a curmudgeon, as I fear I could easily become, but he chose to sift the good from the bad, and become a pillar of Nappanee; more accurately he became a one man Parthenon. I have searched our history and concluded that no one else has given so much to Nappanee in every corner of its foundation: a city councilman, park board president, serving on the Board of Zoning Appeals, the Nappanee Plan commission, and the Board of Public Works, president of the School and Library leasing corporations. The city, the schools, the library: the big three, a true triple threat. He has been elected and appointed and doesn’t have a political bone in him. Few words don’t allow comments on his legendary work for the Masonic Lodge and his parallel 40 year pastoral career. He is Nappanee’s Renaissance man. I stand in awe. Fortunately, I have had no interaction with him to describe Dave’s tenure as Nappanee’s judge. 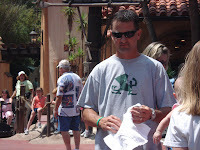 While visiting Disney's Magic Kingdom recently, I did a lot of tee shirt watching while standing in line with my three year old granddaughter waiting for Mickey Mouse's autograph. 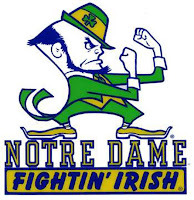 This one with the silhouette of the Notre Dame Fightin' Irish Leprechaun called to mind that it was designed by artist Ted Drake. It is the nation's most famous college mascot logo (He also designed the Chicago Bulls logo). I sought him out in 1965, the year after he designed the Leprechaun, to design a logo for Pletcher Furniture Village before Amish Acres existed. Fresh out of college, I was intrigued by the modern logo design being done by Alexander Girrard, George Nelson, Charles Eames, and other modernists. Drake was well known in the field of sports art, but also had done some stylized oil paintings of Amish buggies, one of which hung in the local bank lobby. I met with him and philosophized about the goals of a new logo for our store. He designed what became known as the Sweet Pea, a burnt orange serifed letter "P" with a woodblock effect featuring a reversed flower making up the center of the letter. It captured the essence of our establishment. Here is his original design for the Leprechaun that shows the mischievous elf of Irish folklore in Drake's unique genius. Unfortunately Notre Dame has seen fit to adapt Drake's design and move from the mischievous to the sinister; perhaps, an appropriate sign of the direction college athletics is taking. It does better reflects the current state of student athletes whose eligibility often hinges on their last arrest and the oft discovered rewards for winning at all costs, whether through illegal body or monetary enhancement. National Youth Theatre has announced the winners of its Second Annual National Youth Theatre Awards to honor outstanding work in youth theatre. This year more than double the shows from last year were considered for the awards, including 89 youth productions from 56 different theatres in 44 cities spanning 11 states. Emily Laudeman, a Round Barn Theatre veteran, has been selected for an Outstanding Lead Actress in a Musical. Emily, who is home schooled, is on her way to Elon University in North Carolina to study music theatre in its performing arts program. Yes, Emily has a God given talent. But here’s the story of how she honed her talent to achieve this national recognition. At the age of 14 she took to our stage with a flourish as one of the fluorescent Bird Girls in Suessical: The Musical. She began taking voice lessons for Marty Fox and others or our company. She filled in as Katie Yoder in Plain and Fancy when she was needed. She starred in Bye Bye Birdie. She sweat out dance rehearsals while attending untold rehearsals. 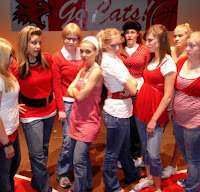 She was the role model for 16 other high school student actors in our sold out production of High School Musical. She fulfills all of her roles with maturity well beyond her years. There is always a smile on her face. No contemporary athlete works harder or applies his or her talent with more concentration than Emily. She makes being in the business of live musical theatre a joy. The award winners were selected from nominations by a panel of eight judges and reviewers. In addition to the youth who performed in the youth theatre companies, any minor (under age 18) who performed at a show reviewed by a National Youth Theatre judge was also considered for the awards, as well as the adults who participated in the youth theatre productions backstage (directors, set designers, costume designers, etc.). The winners will be formally presented with their awards at a ceremony honoring their accomplishments the night of Sunday, August 12 at the Herberger Theatre in Phoenix, Arizona, a space generously hosted by Valley Youth Theatre who will be performing Joseph and the Amazing Technicolor Dreamcoat at the theatre.